Two-hundred and twenty miles of the National Road run through Ohio and a stone marker on the north side of every mile told travelers how many miles they were from Cumberland, Maryland, the beginning point of the highway. To date, over 83 of these stone markers remain along the original routes of US 40. In Ohio, the markers were a square column with a rounded head. Each is marked at the head with the distance to the eastern terminus of the road at Cumberland, Maryland. Below, the square base is set at an angle to the road, with exposed sides showing the distance to the nearest city or village for the east- or west-bound traveler. As originally built, the markers were 5' tall and set directly into the ground, leaving 3' exposed. Above is a marker in Cumberland Maryland indicating that place as being the location from where all of the National Road markers were measured. It is located not far from the confluence of the Potomac River and Will's Creek. At the beginning of the 19th Century, Cumberland was on the edge of the frontier. The earliest Ohio markers were a type of reinforced concrete material made in the 1830s. Only a small number of these have been identified, including several in Madison County. Since they did not weather well, most of these early markers were replaced in the 1850s by sandstone markers. Approximately 80 original sandstone markers remain in the state, although many are not in their original locations due to the reconstruction or realignment of the road over time. Most of the markers are located in the eastern half of the state; no original mile markers are located further west than Clark County. During the early days of the National Road, an average day for cross-country travelers would mean they would only travel about 10 miles. This was the average distance between the Pike towns, inns and taverns along the road. 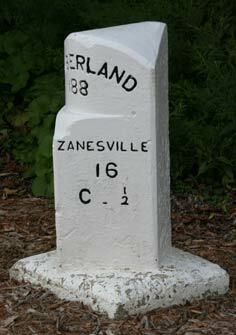 In 1834, it was reported there were two taverns for every mile of road from the Ohio River to Zanesville. The use of mile markers goes back to the Roman Empire where its roads were marked at periodic intervals that were primarily used for the efficient movement of troops throughout the empire. This tradition was also used extensively in Great Britain and thus became part of the American landscape. Although the shapes varied greatly, the concept remained the same. The example at right is a cast-iron British mile post commonly used throughout Great Britain. Each state the National Road passed through was required to have their own mile marker designation. The Maryland marker shown left below was made from cast iron. Ohio's marker shown in the center, and a nondescript Indiana marker shown at far right. Located 16 miles east of Zanesville and 1/2 mile east of Concord.